Imagine a busy street near your home where you have to jostle for every inch of walking space, where the air laden with vehicle emissions bears down heavily on you, and you wish everyday that your round of the shops lining it could be safer and more comfortable. Now imagine, you step out one day to find only adults cycling away in neat lanes along the same street, children playing snakes-and-ladder inside life-size boards on the clean pavements, youngsters dancing to Bollywood music on a makeshift stage on one half of the road! Well, it could happen. And it has actually been happening in many Indian cities as they take to observing open street days, either as a pilot run, a periodic event or on a regular weekly basis. A few kilometres of major roads in the city, that are usually choked by vehicles, are thrown open for public recreation on these days. Each city has its own versions of the event, of course. and hold different activities — from yoga sessions to street plays, rangoli competitions or skating runs for kids. Whatever the mix, it reminds you of older times when entire communities would get together, socialise and have fun. Open street events have been held across the world for a while. They create a vision of what people-friendly streets would be like, spreading awareness and encouraging the public to switch to public transport or non-motorised transport (NMT) such as walking and cycling. During the event, people of all incomes, gender, age groups and religions come together and occupy the roads. The concept originated in Bogota, Columbia, in the 1970s, when a few streets were opened to the public for recreation. Now, every Sunday, 121 kms of roads in Bogota are closed to vehicles. Many other cities, from Philadelphia to Cape Town, have open street events too. As Indian cities grow at a rapid pace, private vehicles are seen crowding out pedestrians and cyclists, making transit extremely dangerous for them. Given inadequate public transport, better-off populations prefer cars or cabs. City streets are primarily designed for cars as well, prioritising wider roads, flyovers and the like. This has also led to alarming levels of air pollution, one of the top causes for premature deaths in India. These concerns led to the launch of ‘Raahgiri Days’ in November 2013 in Gurgaon. ‘Raahgiri’ is a fusion of ‘raah’ meaning a journey towards a goal, and ‘giri’ adapted from the ‘Gandhigiri’ concept. The idea was simply to allow people, even if for just a day, to take over the streets otherwise dominated by cars and motorised private transport. In Gurgaon, 4.5 kms of major roads were closed every Sunday from 7 am to 12 noon when Raahgiri Days first started. 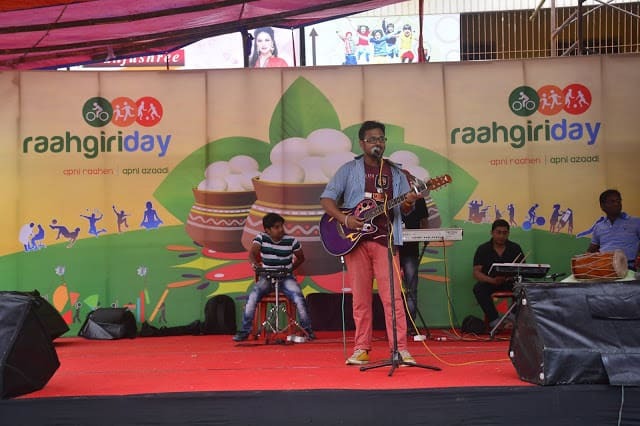 It was organised by the Raahgiri Foundation, formed by five organisations including EMBARQ India, a sustainable mobility initiative by the global research organisation World Resources Institute (WRI). WRI is an empanelled agency with the centre’s Ministry of Urban Development (MoUD), and works with many state and local governments on sustainable transport as one of their key focus areas. 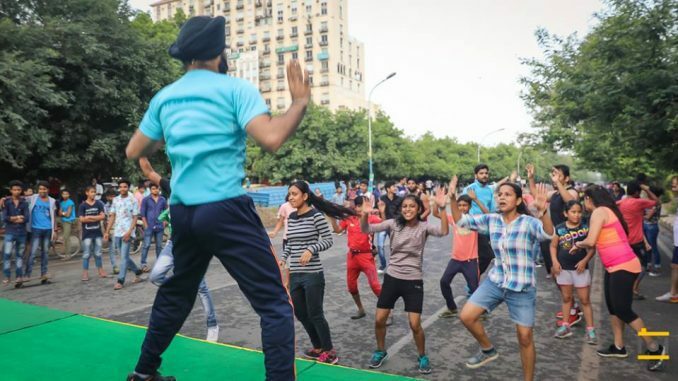 According to WRI India, around 10,000 people took part in the inaugural Raahgiri Day in Gurgaon, and the number climbed to 90,000 by Week 8. Zumba, skating and aerobics were some of the events organised. 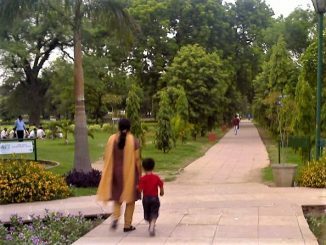 After the success of the Gurgaon event, New Delhi municipal corporation (NDMC) approached Raahgiri Foundation to hold the event in Delhi, says Sarika Panda Bhatt, Trustee of Raahgiri Foundation, and Manager – Cities and Transport at WRI . “Once we organised it in Connaught Place in New Delhi, the event got the attention of national media, and more cities started approaching us,” she says. City administrations take ownership of the events, and use police help in holding it; the Foundation only gives them information and support, says Amit Bhatt, Strategy Head – Integrated Urban Transport at WRI. Local organisations and media partners usually support the events too. Sarika says that 56 cities have organised open street/vehicle-free days so far. In many cities, the event is known by different names. It’s ‘Equal Streets’ in Mumbai, ‘Happy Streets’ in Thane, ‘Namma Chennai Namakke’ in Chennai, ‘Pathotsav’ in Bhubaneswar and so on. 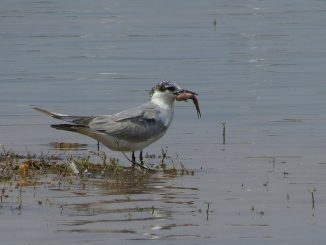 There are local variations in the events too. 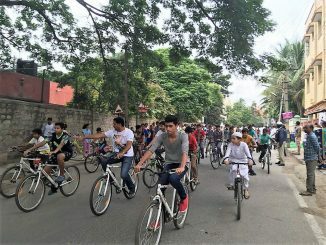 For example, in Bangalore, these events started as early as in October 2013 with ‘Cycle Days’ in residential neighbourhoods, making it the first such open street event perhaps to be organised on a large scale. A couple of kilometres of the roads were opened to cyclists on Sunday mornings in select neighbourhoods. The event was held on a Sunday each month, for three consecutive months in a neighbourhood. This was organised by the Bangalore Coalition for Open Streets (BCOS), a collective comprising Karnataka government’s DULT (Directorate of Urban Land Transport), EMBARQ and other NGOs, and cycling groups. So far, 32 neighbourhoods have participated and more than 300 cycling days have been held since its inception. There have been similar initiatives on varying scales, supported by other institutions too. For example, the Chennai-based Urban Works Institute, better known perhaps by its former name ITDP (The Institute for Transportation and Development Policy), has also initiated several such events in cities across the country. In October 2016, ITDP offered technical counsel to the Pune Municipal Corporation (PMC) as the latter organised a weeklong trial in a stretch of 1.5 kms between Bremen Chowk and Parihar junctions in the busy Aundh district. During this pilot project, half of the road between the above junctions were completely reallocated for pedestrians and cyclists by combining various elements of decongesting public spaces, thus giving them enough room for safe movement. Similar projects have been reported in cities like Coimbatore, Kochi and Mangalore. However, it has been noted that open street events are held sporadically in most cities. There are only 5-6 cities, including Bengaluru, Mumbai and Delhi, that hold these events continuously, with rare interruptions during heavy rains. In Bengaluru, for example, in most months there are up to eight cycle days happening depending on how many community partners wish to organise it. That it has run without a break for four years has been possible because the model is a community driven one instead of a centralised model, say organisers and participants. Some cities like Ranchi stop the event during monsoons or summers, and resume it afterwards. According to WRI, some 95 lakh people have participated in their open street events across the country so far. Sarika says that participation usually is in the tens of thousands in every city initially, but that it tends to stagnate as the months pass by. “After about a year, the numbers come down to 5000 or so per event. This is because different groups of people attend it on different days,” she says. There are also cities that have stopped the event entirely. Chandigarh, for example, discontinued it after a year and a half. “Cities face two constraints. One, if the officer who initiated the event gets transferred and the incoming officer is uninterested. Two, if sponsorship from companies dry up,” says Sarika. Given the above, can open street days bring about a transformative change in the way cities commute? Can they really move cities on the path towards long term sustainability, which has been a primary objective of these events in India? That is what we shall examine in a follow up to this article. **Some facts in the article have been updated since it was first published. The cycle day event in bangalore was the first open streets events in India. It started as a BCOS event consisting of DULT, Praja RAAG, ESAF and cycling enthusiasts of bangalore. After the first year of it being a once a month BCOS led initiative it became a every Sunday neighbourhood and citizen led initiative with BCOS only facilitating these communities.